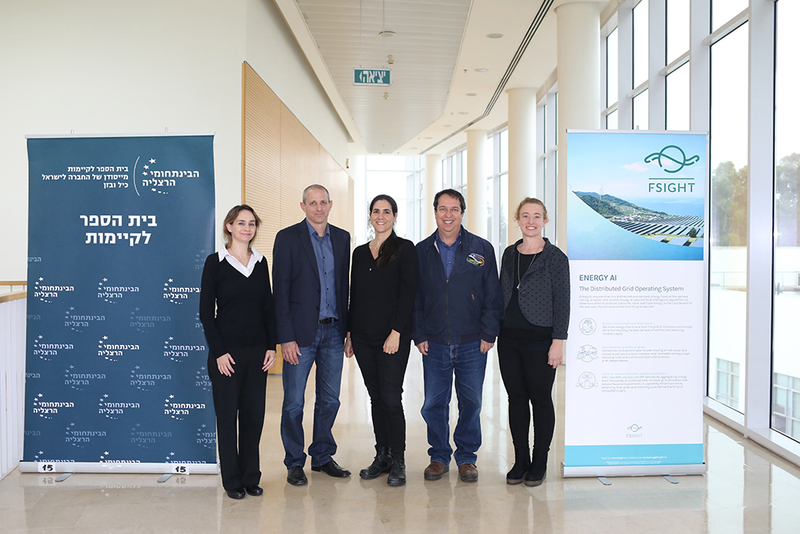 The Schools of Sustainability and Economics at the Interdisciplinary Center (IDC) Herzliya academic institution in Israel, will collaborate with FSIGHT’s Gilboa Iris Distributed Energy Resources Sustainable Community Pilot. FSIGHT Energy Ltd. is an Israeli startup company that has developed an Artificial Intelligence platform for advanced electricity management over a distributed grid. The Interdisciplinary Center (IDC) research college in Herzliya, Israel, has joined FSIGHT’s Gilboa Iris Distributed Energy Resources Sustainable Community Pilot. FSIGHT Energy Ltd. is an Israeli startup company that has developed an Artificial Intelligence platform for advanced electricity management over a distributed grid. In the past 3 years, FSIGHT has installed its distributed energy management products at dozens of leading utility sites around the globe. FSIGHT has a highly qualified and diverse team of researchers, developers and industry experts, with over a decade of experience in the energy sector. FSIGHT’s central product is Energy AI, the first-ever fully automated solution for smart distributed energy management. The Energy AI platform saves energy costs by optimizing energy flow for end users, service providers and the grid operators. Energy-AI predicts energy usage, production and prices, makes real-time consumption and storage decisions, and performs peer-to-peer or peer-to-grid energy trading. FSIGHT’s Gilboa Iris Pilot is a collaboration among FSIGHT, Kibbutz Maale Gilboa, Dalia Power and several international commercial enterprises. Kibbutz Maale Gilboa, a community of about 800 people in the north of Israel, is an early-adopter of advanced energy technology, and is home to a unique set of conditions that provide an ideal real-life lab for testing the technical and business scenarios of smart energy management. The Kibbutz operates a private grid environment, which is self-regulated and autonomously managed and distributed. The Gilboa Iris Pilot is the first full-fledged distributed grid and peer-to-peer (P2P) community energy project. FSIGHT’s Energy AI platform will be deployed at Maale Gilboa’s facilities and used to manage energy consumption, production, storage and trading within the Kibbutz community. The pilot enables FSIGHT to test and fine-tune features such as optimal consumption timing according to local cost conditions, efficient selection of energy sources, consumption vs. storage decisions, and automated P2P energy trading among Kibbutz members. The pilot’s goal is to demonstrate how smart energy management yields significant cost savings for the individual and the community, and enables the efficient use of green, self-sustaining energy production from renewable sources. FSIGHT is excited to welcome the IDC research college as an academic partner in the Gilboa Iris Pilot. IDC is dedicated to the pursuit of excellence in education and research and the training of future leaders by providing educational programs which combine academic study with practical, hands-on training and encouragement for innovative thinking. IDC’s primary goal is to give their students the tools they need to become leaders both in Israel and abroad.